Ask yourself, “What percentage of your day do you spend thinking about food, weight and body image?” If your answer is that you spend so much time with these concerns that it interferes with your happiness or functioning, then we invite you to consider that you may have an eating disorder. Looking at eating disorders this way puts EDs on a continuum, rather than a yes or no question. You can have some degree of unhappiness, depression, anxiety, low self-esteem and preoccupation because of body image and eating issues. And if you do, we invite you to participate in ANAD programs to get the support and help that you need to recover! Anorexia is not getting enough calories in, which leads to a significantly low body weight. The person with Anorexia will also show an intense fear of gaining weight or becoming fat. Or if the fear is not shown, there is still persistent behavior that interferes with weight gain, even though weight is significantly low. While suffering from Anorexia Nervosa, a person also has a hard time recognizing the seriousness of their current weight, or is unable to see how thin or underweight they are, or the person is very reliant on their body weight and shape for their self-evaluation. Body dysmorphic disorder (BDD) is characterized as an obsession with an imaginary defect in physical appearance or an extreme concern with a slight physical blemish, which other individuals may not even recognize. Individuals with BDD have misconceived beliefs regarding their body and the most common body parts for both men and women to have false misconceptions about are skin, hair and nose. Others include eyes, teeth, chin, legs, lips and height. To learn more about BDD, visit this article, written by ANAD Partner Center for Discovery. Bulimia is defined as recurrent episodes of binge eating. An episode of binge eating includes eating an amount of food that is definitely larger than most people would eat within a two hour time period, with a sense of lack of control over eating during the episode (a feeling that one cannot stop eating or control what or how much one is eating). In Bulimia Nervosa, a person also recurrently tries to make up for eating by compensating with fasting, self-induced vomiting, excessive exercise or use of laxatives, diuretics or other medications. A person with Bulimia is very worried about their weight or shape. To learn about how to care for your dental health while struggling with Bulimia, visit our dental health page. Binge Eating Disorder is defined of recurrent episodes of binge eating. An episode of binge eating includes eating an amount of food that is definitely larger than most people would eat within a two hour time period, with a sense of lack of control over eating during the episode (a feeling that one cannot stop eating or control what or how much one is eating). A binge eating episode may also include: eating much more rapidly than normal, eating until feeling uncomfortably full, eating large amounts of food when not feeling physically hungry, eating alone because of embarrassment over how much one is eating and feeling disgusted with oneself, depressed or very guilty afterward. Pica is the eating of substances that have no nutritional value for a period of at least one month. For example if someone eats cotton or clay, this would be considered Pica. Rumination Disorder is repeated regurgitation of food for at least one month, which includes re-chewing, re-swallowing or spitting out food. Avoidant/Restrictive Food Intake Disorder (ARFID) is an eating or feeding disturbance where a person is unable to meet their nutritional or energy needs. Some ways that you might notice this are significant weight loss or not keeping up with expected growth, nutritional deficiencies, dependence on nutritional supplements or having one’s nutritional issues interfere with their psychosocial functioning. 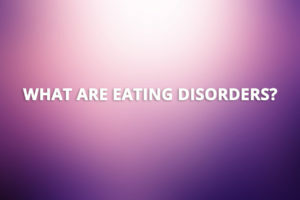 What is Other Specified Feeding or Eating Disorder? Night Eating Syndrome: this occurs when a person consumes at least 25% of their daily intake after the evening meal. Waking up after going to bed in order to eat may also occur. Unspecified Feeding or Eating Disorder is for disorders which do not meet the criteria of any of the above disorders, but still cause great emotional upset or interferes with daily life. Over the last 40 years of ANAD’s existence, we have heard time and time again that people have been told that they did not have an eating disorder because their weight was not low enough or because they were not a young, white female. ANAD wants you to listen to your own feelings and body. If you THINK you have an eating disorder, you most likely do. ANAD is here to help you through any confusion you may have about what is going on with your body, your feelings, your eating and your hunger. Please do not hesitate to contact us if you think that you have an eating disorder or you think that a loved one has an eating disorder, even if a medical professional, parent, teacher, trusted adult, friend or otherwise has told you that you don’t. They don’t know you the way that you know yourself. ANAD is here for YOU.